Diagram showing principal systems of association fibers in the cerebrum. Association fibers are axons that connect cortical areas within the same cerebral hemisphere. In human neuroanatomy, axons within the brain, called fibers, can be categorized on the basis of their course and connection into association fibers, projection fibers, and commissural fibers. 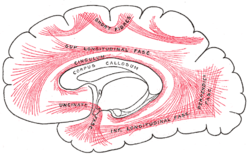 The association fibers unite different parts of the same cerebral hemisphere, and are of two kinds: (1) those connecting adjacent gyri, short association fibers; (2) those passing between more distant parts, long association fibers. Many of the short association fibers (also called arcuate or "U"-fibers) lie immediately beneath the gray substance of the cortex of the hemispheres, and connect together adjacent gyri. Some pass from one wall of the sulcus to the other. Diffusion tensor imaging is a non-invasive method to study the course of association fibers. 1 2 Standring, Susan (2005). Gray's Anatomy: The Anatomical Basis of Clinical Practice (39th ed.). Churchill Livingstone. p. 411. ISBN 9780443071683. The nerve fibres which make up the white matter of the cerebral hemispheres are categorized on the basis of their course and connections. They are association fibres, which link different cortical areas in the same hemisphere; commissural fibres, which link corresponding cortical areas in the two hemispheres; or projection fibres, which connect the cerebral cortex with the corpus striatum, diencephalon, brain stem and the spinal cord.